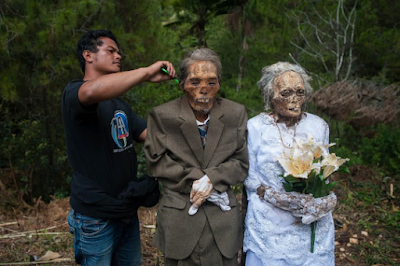 The ceremony involves exhuming even the skeletons of children; fixing damaged coffins or replacing them before the dead bodies are led around the area by following a path of straight lines during the ritual. A 32-year-old young man, Herman Tandi, dug up the skeletons of his grandparents, Jesaya Tandibua and Yakolina Namanda, that were buried four years ago, brushed their hair and wore them wedding suits. 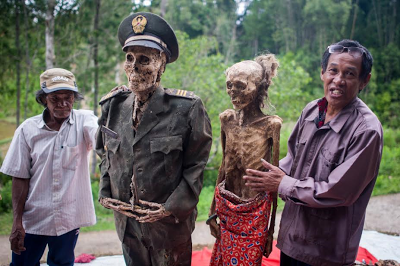 Another family dug up the skeleton of their relative, an army veteran buried over ten years now, dressed him in army uniform for the ceremony also known as Ma’nene ritual before taking ‘family’ pictures with him. In another family, the skeleton of Paul Sampe Lumba, who has been dead for seven years, was dressed on eyeglasses, a tie and a striped blazer so he could look good in the family photo while Ne’Tampo, who has been dead for 30 years receives his own makeover.